When a student gets on a horse to take that first riding lesson, their greatest concern is staying there. Everyone is afraid of falling off, particularly in the beginning. Whether you are the student or whether you are the instructor, you need to be aware of this fear and aware that it is very normal. Fear of falling creates both mental and physical tension. 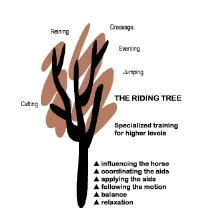 That’s why relaxation is at the base of the riding tree, the set of skills a rider needs to master in order to develop an independent seat. In order to relax, you have to become aware of every part of your body--every muscle, every joint--and find any places where you are holding tension. When you can let go of all of this involuntary tension, you can move to the second level of the riding tree. When you can stay relaxed over the horse’s center of gravity, you are in balance. When you are in balance, you can stay on the horse. Essentially, the horse’s center of gravity is right where you sit. If you are gripping with your calves or gripping with your thighs or hanging on the reins in order to stay there, you are not balanced. Good balance requires both being relaxed and being centered. You need both vertical balance and side-to-side balance. The vertical balance refers to the position of your upper body. When you are vertically balanced you are not tipping too far forward and you are not leaning too far back. Side-to-side balance means that you have even pressure on both seat bones. You are not leaning or falling off to the left side or to the right side. You need to use your muscles correctly in order to maintain this centered alignment over the horse’s center of gravity. Using your muscles correctly means tensing the right muscle groups to help keep your body stabilized over the horse’s center of gravity but this is an “athletic” muscle tension rather than the nervous muscle tension that destroys relaxation. The primary muscle groups that you use to maintain alignment or balance are your upper and lower abdominal muscles. Remember that balance is an issue for the horse, too. Depending on where the horse is in his progressive training the horse may be learning how to carry himself and the weight of the rider while staying balanced. When you balance quietly over the horse’s center of gravity, you help him stay balanced. If you lose your balance, you will throw the horse off balance, too. Becoming aware of how your body is aligned will help you develop better balance. Riding instructors preach to beginning students about lining up the elbow, the hip, and the ankle so that everything drops straight down. If your feet are stuck straight out in front of you, your upper body is going to come back behind the motion of the horse. If your legs are too far behind you, your upper body is going to go in front of the motion of the horse. When the horse feels this, he wants to correct it. If you fall behind the motion, horses will do one of two things. They will either run forward or they will slow down, perhaps even stop, as they try to position you back over their center of gravity where it feels comfortable for them to carry your weight. As your body stays relaxed and centered over the horse’s center of gravity, its alignment may change depending on the horse’s direction, speed, and gait. This is particularly true when you finally reach the higher levels of any riding sport. As her horse leaves the ground in front of a jump, for example, the jumper rider’s upper body folds forward because she must realign her body to stay over the horse’s center of gravity. In the same way, a cutting horse rider may sit heavier on one seat bone as his horse changes direction or a reining horse rider may put burdening weight on both seat bones as his horse does a sliding stop. They are realigning their bodies to stay over the horse’s center of gravity and remain in balance as the horses shift their own balance in order to perform at higher levels. Understanding the riding tree helps you build a solid foundation, an independent seat that will take you into the higher levels of whatever riding discipline you choose to pursue. When you are relaxed and balanced, you can begin to work on following the horse’s motion at the walk, trot and canter. Your communication with your horse moves to a new level. Then you can begin to apply the aids in ways that ask the horse for specific shapes. As your communication with the horse improves, you will begin paying attention to rhythm and timing, coordinating the aids for greater precision. Finally, instead of just asking for what the horse already knows, you will be able to start influencing the horse, teaching him new shapes and new games. In the beginning, it may seem like an impossible goal. Just keep riding.